The 26-County Taoiseach Brian Cowen may narrowly win a confidence vote among his Fianna Fail party TDs tonight [Tuesday], but his leadership of a withering political organisation is likely to be short-lived. Minister for Foreign Affairs Micheal Martin, who publicly called on Cowen to quit just hours after the confidence vote was announced on Sunday, has said he believes the contest will “go to the wire”. Martin’s open leadership ambitions now contrasts with the more calculating positions of Minister for Finance Brian Lenihan and Minister for Tourism Mary Hanafin, both of whom have yet to declare their position on Cowen’s leadership. Lenihan said he would make his views known ahead of the meeting, scheduled to start at 5.30pm. However, it is widely believed he will come out in favour of Cowen -- on the private understanding that Cowen will anoint him as successor following the upcoming General Election. Hanafin is set to take a more nuanced line in the hope of positioning herself for the future leadership battle. Despite Fianna Fail languishing at 14% in the opinion polls, Cowen mounted another belligerent defence of his leadership on Monday, even claiming he could stay on as leader until after the general election “for however long as the party wishes to have me”. But his storied policy disasters have lately become clouded by suspicions that his secret talks with Ireland’s most notorious bankers ahead of the banking meltdown in 2008 could amount to a criminal conspiracy. Most Fianna Fail backbenchers are now facing the end of their political careers, and a steady stream have announced they will not contest the next election. With the power to determine who will will lead Fianna Fail into the most critical election in the party’s history, most appeared to be fatalistically backing Cowen. But the vote is expected to be tight with a number of TDs declaring against Mr Cowen, including former Minister Willie O’Dea, who said the party faced an “unacceptably high risk of electoral annihilation”. Mr Cowen’s supporters are also concerned about the large number of TDs who are not declaring their intentions publicly -- and if those who did were telling the truth. Only tonight’s secret ballot to be held in Leinster House will reveal how far the fear of ‘changing horses mid-stream’ has been replaced by a last-minute drive for change. Sinn Fein Dail leader Caoimhghin O Caolain said Cowen was “determined to prolong the life of a disastrous Government that should have been hunted from office long ago”. The dilemma for the Taoiseach’s would-be replacements “may be fascinating for political observers but it is irrelevant as far as the vast majority of people are concerned,” he added. Sinn Fein TD Martin Ferris said the Fianna Fail heave was turning into a “farce”. 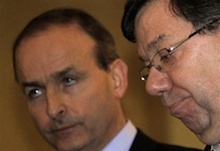 “If Micheal Martin has no confidence in Brian Cowen he is only catching up with the rest of us. “Both Brian Cowen and the Fianna Fail party have no credibility and should have left the stage long ago.